When the other avatar accepts, then a Barter window and an Inventory window pop up. Be sure to check everything before you press Accept. The transaction is over. Open the inventory window to check if the transaction went well. Now, let's look at Stores. You can open Stores only when your avatar's level is above 5. If your level is above 5, then press Open/Change a Store (hotkey: M) located in the bottom of the interface when your avatar is standing up. 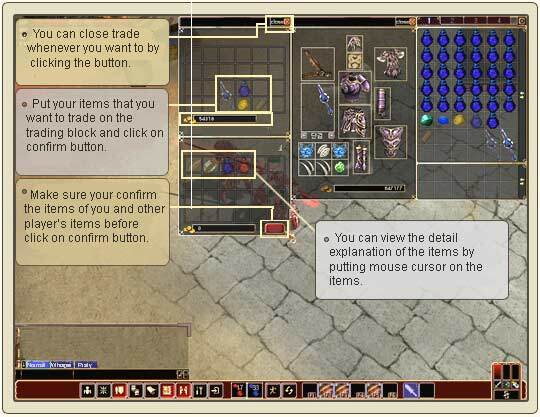 Drag and drop items or skills(magic) you want to sell from the inventory or skills window to Stores window, and then you will see a pop-up asking for the price. Type in the name of your store if you are done with registering items or skills (magic) you want to sell. Exit the Stores window when you are ready. Press Sit button (hotkey - V) to start the store. Press Shift + Left-click on the Store sign if you want to use the store of other avatars.